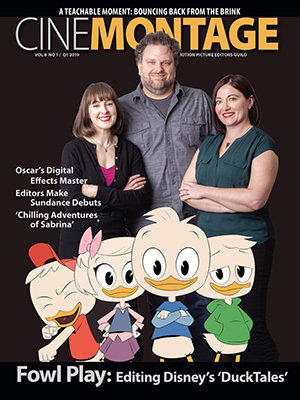 This issue of CineMontage, for all its many virtues, isn’t the most important piece of mail you’ll receive this month. Local 700 members, as well as members of our 12 sister IATSE locals who share the Basic Agreement, will soon receive ballots in their mailboxes. The election will determine whether we ratify the tentative contract deal IATSE negotiators reached with the Alliance of Motion Picture and Television Producers (AMPTP) in late July. Union membership means that you have the right to a voice and a vote on the job. Most employees in this country don’t have any mechanism to participate democratically in the decisions that shape their working lives. 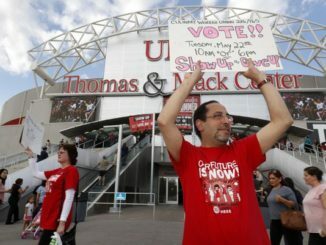 When non-union employees are unhappy with the terms their employers offer, often their only recourse is to vote with their feet. As a Guild member, though, you’re going to get a ballot. You need to use it. If you have been following the news in the trades or the buzz (and bumptiousness) on social media, you know that our leadership’s objections to the deal have occasioned debate within our IATSE family. Other IATSE locals’ leaders have endorsed the tentative agreement, believing that it’s a satisfactory compromise even if it falls short of many of our collective ambitions. The ensuing discussions amongst rank-and-file members — in workplaces, at gathering places and, largely, online — have been lively. Given all that you’ve probably been reading of late about the contract debate in your e-mail, in the trades, on Facebook and on Twitter, what remains to be said here? The format of a quarterly magazine doesn’t lend itself to tracking the mercurial movement of news. When fights like these play out with the quicksilver speed of tweets, a journal stamped on dead trees will necessarily prove inadequate to the task of keeping its readers informed up-to-the-minute. I won’t, therefore, use this space to delve into the details of this rapidly unspooling fracas. Let’s look instead to the long game. We don’t know how the upcoming ratification election will play out. It is possible that the members of the 13 IATSE locals concerned, in the aggregate, will approve the deal. 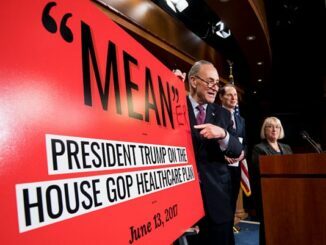 It’s conceivable that they’ll vote it down. There is even the potential that, should enough IATSE members vote against the deal and should the AMPTP refuse to budge on the issues that are of chief concern, that this contract fight will lead to the IATSE’s first-ever industry-wide work stoppage. What we can predict, though, is that your Guild will be stronger for the struggles we are going through this summer. The fight for a fair Basic Agreement has catalyzed an aggressive program of internal organizing, a program that has already done much to renew the vitality of our union. Such organizing has drawn members together and drawn members into the work of the union like never before. Editors Guild National Executive Director Cathy Repola addresses members at the Los Angeles Special Membership Meeting held at the Sheraton Universal in Universal City on July 21. What do I mean by “internal organizing?” When (or if) you think of labor organizing, you likely think of campaigns to unionize non-union workplaces, efforts we organizers refer to as “external organizing.” Remember the scene in Norma Rae, in which Sally Fields holds aloft a hastily scrawled sign, inspiring her fellow employees in a North Carolina textile mill to shut down their machines? Or — should a movie from four decades ago prove too distant to recall — perhaps four weeks ago you watched Sorry to Bother You and remember how that film dramatizes the raucous fight to unionize an Oakland telemarketing firm? Those are examples (however cinematically stylized) of what external organizing looks like. Despite a dearth of movies and television about labor activism, at some time or another you’ve probably seen on the screen (or, if you’re a regular reader of this column, in these pages) such stories of co-workers in non-union shops who forge bonds of solidarity in order to generate the leverage to demand more of their bosses. But it’s critical to bear in mind that, unlike in the movies, the credits don’t roll and the struggle doesn’t end once a workplace is unionized. The protagonists who win an initial union contract at a previously non-union employer have brought to conclusion a chapter; they haven’t closed the book. The process of forging and renewing our solidarity — and of harnessing that solidarity to improve folks’ working lives — is necessarily always ongoing, ever unfinished. That process of organizing those who are already members of the organization we call internal organizing. What does such internal organizing look like? It looks like the extraordinary flurry of rank-and-file union activity we saw this summer in edit rooms, in post houses and on social media sites. It looks like the slew of volunteers on both coasts who embarked on a systematic program of member-to-member outreach, ensuring that virtually every active Local 700 member was personally contacted by a colleague via text message to talk about the contract campaign. It looks like the activist members who took it upon themselves to design pro-union graphics and memes for social media and to circulate petitions online in support of their negotiators in contract talks. And it looks like all that our Membership Outreach Committee has done in recent years to spread the gospel that our union is only as strong as its members are prepared to take ownership of it. 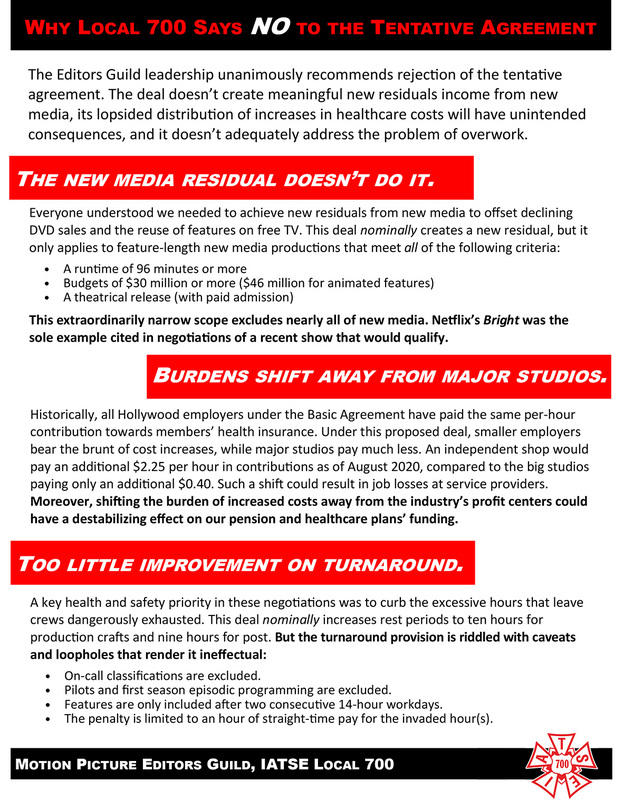 In short, it looks like literally thousands of post-production professionals coming to understand that this contract fight is their fight, together, and that they needed to show up and step up — together. We saw the results of such organizing on display in the rapidly assembled Special Membership Meetings the Guild held in New York, Marin County and Universal City in July. Roughly 2,000 Editors Guild members — far more than had ever previously attended any Local 700 event — came out for these meetings. 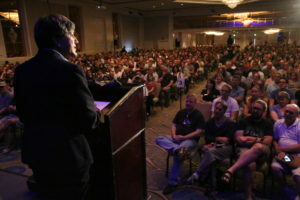 Standing-room-only crowds packed huge hotel ballrooms with electrified Guild members eager to discuss and participate in the business of their union. Shoehorned into meeting halls, our members came together to make clear that they would continue to stand shoulder-to-shoulder to attain the strongest possible union contract. 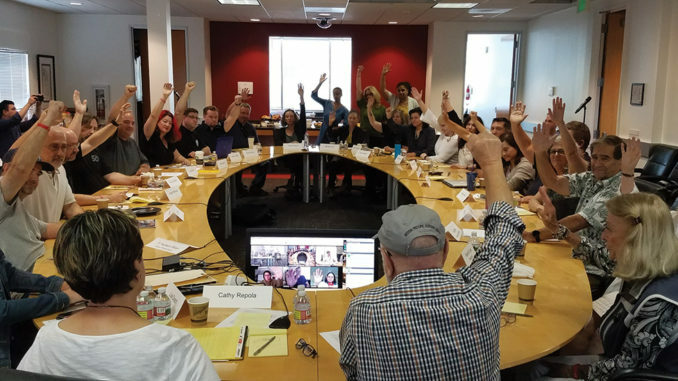 The tentative agreement reached in late July doesn’t answer the aspirations expressed by the thousands of Editors Guild members who crammed into those meetings. 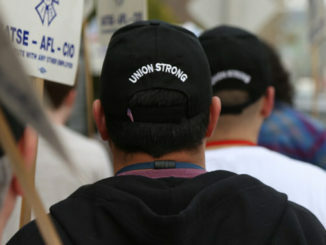 It remains to be seen whether it meets with the approval of the combined memberships of the 13 affected IATSE locals. But whatever results from the upcoming vote, our members have a newfound sense of themselves as active participants in a community coalescing around shared interests and shared values. Folks have awakened to the fact that it’s not enough to simply pay their dues and leave the work of the union to union leaders or staff. This summer gave rise to an awareness of and enthusiasm for the roles all members can play in standing up for themselves and standing up for one another. The long game — the project that must persist long after this particular contract fight has been resolved — is to continue to cultivate that spirit and thus make of our union an even more formidable force. 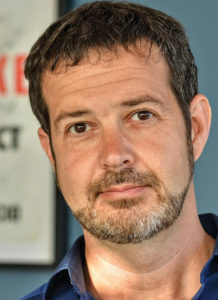 Rob Callahan is the Motion Picture Editors Guild’s National Organizer. He can be reached at RCallahan@editorsguild.com. Learn more about organizing with the Guild at www.editorsguild.com/Organize.